A man charged with aiming his SUV at a Boston police officer in a crowded Roche Bros. parking lot then speeding off only to crash into several cars with a loaded gun on his front seat before being nabbed in Roslindale will spend at least the next week behind bars, the Suffolk County District Attorney's office reports. Read more. A farewell before Larry is released. Ever since Roche Bros. in West Roxbury re-opened its seafood department before Valentine's Day, one lobster went unsold: The biggest of them all, a lobster so large the other lobsters crowded around the edges of the tank just to stay away from him, so large that shoppers would bring their kids over to see him. 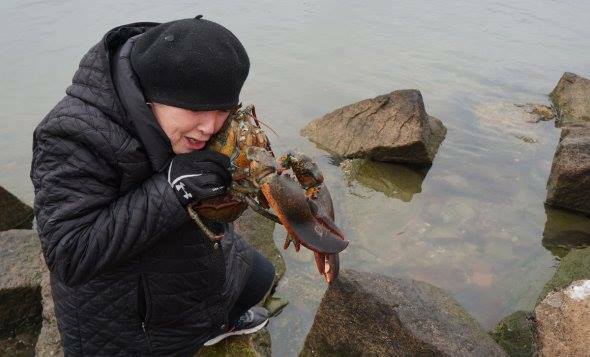 The poor plight of the lobster began to bother some people over in Roslindale, who used a neighborhood Facebook group to begin to ponder doing something about Larry's fate - yes, of course they named him Larry. Read more. Meanwhile, at Cambridge Whole Foods, you can't even see the cash registers from the back of the lines. Allow extra time to get the milk, bread and eggs. Kerry O'Brien reported at 6:05 p.m. that the line to get into the Roche Bros. parking lot was backing up well down Railroad Street. Both Roche Bros. and Star Market have spent the last several months remodeling their stores - Roche Bros. to be more like Wegmans and Star Market to be more like Roche Bros. 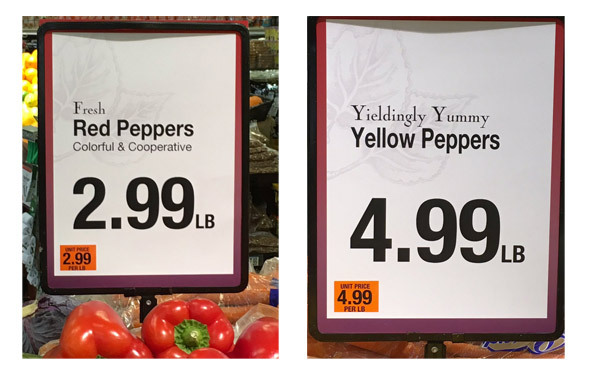 They both use local street names along with numbers to identify their aisles. Read more. When Sheila Fay went shopping at Roche Bros. today, she found somebody had attempted something amazing even by the exacting standards of the store's parking lot: A car whose driver managed to take up four parking spaces. Alas, the judges later had to deduct a full point, because, as Susan Krasker Ellsbree shows us, somebody else managed to squeeze a car (granted, a small one) into one of the spaces. Nick Gemelli spotted these dogs - and their sign - in the parking lot at the West Roxbury Roche Bros. today. UPDATE: Jesus H. Christ, people: I've hidden all the comments on this post because somebody managed to track down the dogs' owners and is now harassing her by phone. You can't beat their meat. Rendering from Roche Bros.
Roche Bros. has begun a redo of its Centre Street store to make it more like its trendier Downtown Crossing store - with more prepared-food and seafood options and a floral area right off the main entrance, rather than a few rows in. Already, the bottle and can return has been temporarily moved outside and the bakery, flowers and customer service moved to temporary areas to make way for the renovations: Read more. When did West Roxbury get weird? 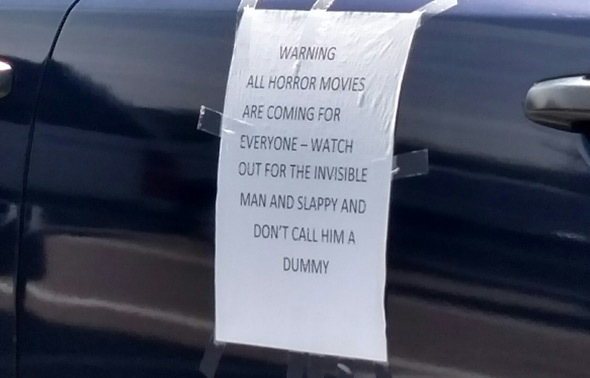 Not long before one photographer was capturing the bus-bus-bus at one end of Centre Street yesterday, another photographer was capturing this sign taped to a vehicle parked at the other end of Centre, in the Roche Bros. parking lot. State Rep. Ed. Coppinger alerts us: Read more. Roche Bros., which already sells beer and wine at its Westwood and Downtown Crossing stores, wants to offer alcohol at its West Roxbury store as well - within eyesight of Macy's Wine and Liquors on Centre Street. Read more. Daniel Guzman takes note of some new signs at the West Roxbury Roche Bros. 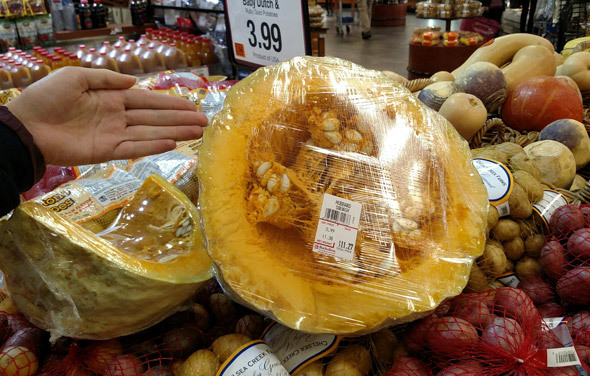 The West Roxbury Roche Bros. decided post-Thanksgiving shoppers needed ready access to squashes larger than their heads yesterday. The Boston Licensing Board today gave Roche Bros. a packie license for its new Downtown Crossing store. At a hearing yesterday, Roche Bros. President Gary Pfeil told the board that the chain held a number of focus groups with current downtown residents and workers and discovered that people enjoying life in the heart of the city have a different way of entertaining guests: They're more likely to have parties with cocktails and appetizers than sit-down dinners. Read more. The new Roche Bros. in the old Filene's Basement goes before the Boston Licensing Board next week to request a license to sell adult libations along with its prepared meals and groceries. The board's hearings begin at 10 a.m. in its eighth-floor hearing room in City Hall. 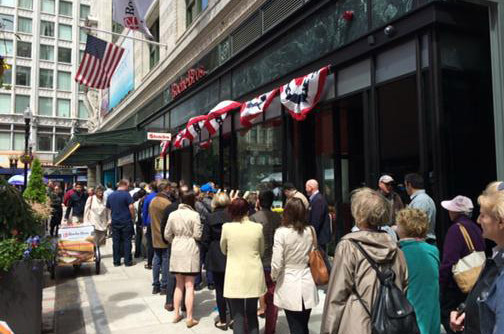 Dan O'Brien thought of Disneyworld when he saw the line of people waiting to get into the Downtown Crossing Roche Bros. on its opening day today. The store is also accessible via the subway stop. Roche Bros. reports its new Downtown Crossing store, opening next Wednesday, will have entrances/exits onto the concourse of the Downtown Crossing T stop.